2016 is the 20th anniversary of Operation Sound System. 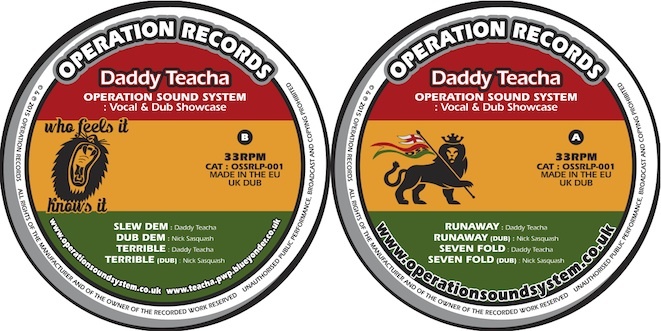 We mark this monumental date with a new heavyweight LP release featuring: Daddy Teacha & Operation Sound System. We are touring non stop in 2016 …. available for bookings in UK & Europe. The vocal delivery & content from UK Pioneer & roots reggae veteran Daddy Teacha is simply of the highest order, conscious, cutting & concise. Voiced over heavyweight riddim tracks that make full use of the stunning melodies provided by live horn section, melodica & percussion. These instruments in combination with driving bass & drums, crashing reverb, sweeping echo & effects all pushed to their limits ensure the dubs are thunderous, sweet sounding & drop heavy like lead, drawing the listener ever deeper into the intense aural experience that is dub. A truly majestic & memorable selection for all soundman & women’s record box. Music to free up & feed your mind, body & soul. Audio & youtube video soon come…. The feature contains a number of tuff questions answered by myself regarding ALL things records, a selection of 12 photos of my much loved records & even a photo of a tired looking me again with record! it was a Sunday lunch interview / photo shoot after a heavy dance the night before with only 4 hours sleep lol . The photo (John Tree photograpy) below is from the shoot, but not used in print. “What do you collect & why? These days I only collect roots reggae. As a kid I had a paper round and a Saturday job working on a farm. I didn’t buy sweets – from the age of nine all my money was spent on records. I still have many of the ones from back then, mostly heavy rock such as AC/DC, Black Sabbath and Rainbow. But even in the late 70s and early 80s I liked reggae and ska, so I’ve also got original releases by Musical Youth, Madness, Specials and Bob Marley too. Thanks to each & everyone who has supported us in 2014… To the Dj’s, sound system, producers, venues, promoters, radio stations, people who bought our releases, t-shirts & hoodies & came to see & danced with us in session…. 18 years & we are still growing. That simply wouldn’t be possible without your support. So from the heart, THANK YOU everyone…. I think its been our best yet… Thank you 😀 our Roots festival was truly amazing & sold out + so many other greeat sessioons, new OSS releases & more still to come…. Also Big thanks to all who voted for us to Play at United Nations of Dub weekender… We won our group & have been voted through by the people, heartfelt thanks for the support.